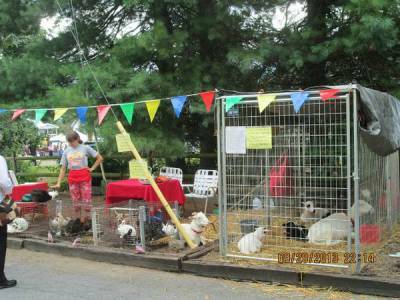 Raising & Sales of Friendly Colorful Hair Sheep, Lambs, Silky Fainting Goats, Hamsters, Bunnies, Chickens & Guinea Pigs. 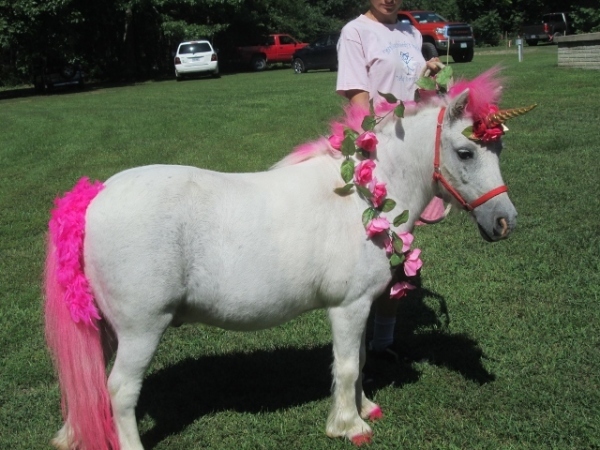 Unicorn for Events - White Mini Horse as a Unicorn with Pink Mane and Tail or colors of your choice if available. 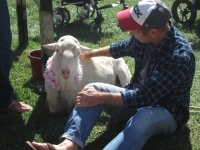 Please always contact us First by Email or Phone, dont just drive out to our Petting Zoo Facilityat the Farm, we may not be avaiable due to pre-scheduled Events. 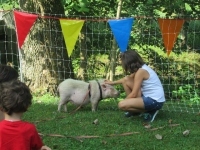 We bring our Petting Zoo of Rescued & Rehabilitated Animals to You & Your Events, we do Indoor & Outdoor events at your place or you can come here to our farm to a designated area where we will set up a temporary Petting Zoo area for you and your group of up to 20 children & Adults. (Farm is by appointment only & we need at least one week notice with $40 hold deposit). Please see details below. Our Animals are Clean Healthy & Friendly.We give each Animal (with the exception of the Ducks, Hamsters & Hedgehog) a good grooming and or a nice bath before each Petting Zoo we do, so you can rest assured you will be Touching, Petting, Hugging & Interacting with Clean, Healthy, Friendly Animals, you won't find many Petting Zoo's that will go to all that extra time, effort & expense to bath their Animals. 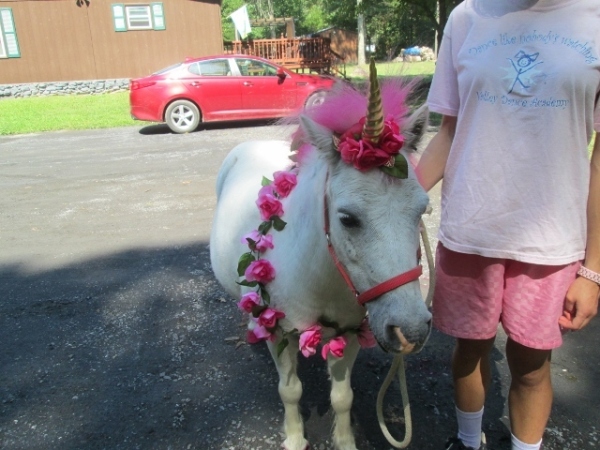 Meet Our Mini Horse as a Unicorn, for your events or just to surprize someone, with or without color. $75 an hour plus $1.00 per mile round trip (to & from event) travel distance charge. 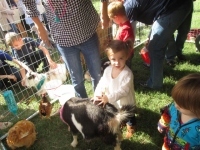 When you request our Petting Zoo, you will give us a date and time you would like us at your event and a street address of where we would be set up with the animals. We will then get back to you with your personalized price quote and options. If your requested time is already booked by someone else you will have to choose another time, we are on a first come first serve basis If you are out of the Area of Edinburg, Virginia there is a $1.00 per mile round trip (meaning going to and from your event) travel fee that is added to your total due. You will then mail in your hold deposit of at least $40.00 to us to hold your day & time, if due to bad weather the event is cancelled depending on situation you can pick another time that isn't already taken or refund can be mailed back minus the cost of mailing it back or you can request the deposit be put toward donations for the animals. Your Balance due payment is due upon our arrival of the event. You can pay by Cash or Check. We require to be able to arrive at least one hour early of your timed event to set up the Animals & Equipment, tables, pens etc. We do prefer if at all possible a grassy area for the animals and if available some shade if you have it. We stay with the Animals at all times. You will get to touch the Animals & interact with them. $75.00 an hour (a minimum of at least one hour please), plus $1.00 per mile round trip travel fee is added to your total, we do Not charge you any extra for us having to carry our pens and equipment to the set up areas but require to be able to unload equipment, set up & Animals as close as possible to where we will be set up. .There is a $40.00 non-refundable hold deposit you must send in to hold your date & time spot ( it is deducted from your total). If bad weather cancels your event you can pick another day & time that isn't already taken by someone else to have us come or you can request your $40.00 hold deposit returned, minus the postage to send it back to you. 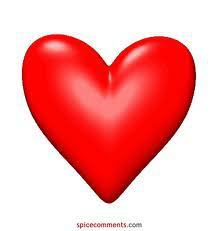 Or you can request us to put it to the Donations for the Animals Care. 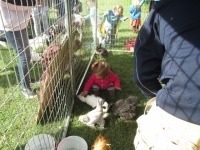 We can also do temporary Petting Zoo's here at the farm, at a designated area with an appointment at least one week notice with a $40.00 hold deposit for your day & time slot, for $60.00 an hour, (the $40 deposit is deducted from your total balance due), limited Parking and sorry but there is NO restroom or bathroom. Our Purebred Katahdin Hair Sheep, (no wool to ever shear or tails to dock off), are raised naturally with their mothers but are around us from their birth, so they are as gentle & tame as being bottle fed. We don't believe in bottle feeding unless absolutely necessary because it is too stressful for baby & mom. They are weaned around two months old then can be ready for their new homes. Contact us to see what we have available at the time of your request. There is a non-refundable $40.00 hold deposit to hold each animal Females are $200.00 each Intact Males are $300.00 each Wethers are $150.00 each The wethers may require to stay a little longer just to make sure the banding is going well for healing. We can add you to a wait list if we don't have anything you like at the present time. 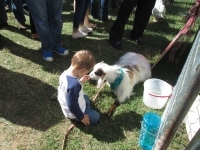 We can add you to our wait list if you are wanting a Lamb, Goat Kid, Hamster, Guinea Pig or Bunny. The Petting Zoo Animals are Various kinds of Bunnies, Various Breeds of Chickens, Ducks, Guinea Pigs, Miniature Hamsters, Hedge Hog, Colorful Hair Sheep (lambs when we have babies), Silky Fainting Goats (kids when we have babies), We also have a Pot Belly Pig we have rescued and rehabilitated along with a recently adopted Miniature Horse. The Animals that we bring to your events may vary because we switch off changing different animals giving them a rest in between Petting Zoo's If you only want a few certain animals for something, ask us, we try to accommodate everyone's request if at all possible and within good reasoning. Example we dressed up one Hair Sheep as a Calf for a black & white cow birthday party. Q -Will I be able to interact with the Animals? A- Yes, you actually do get to touch, pet & hug the Animals Q- Do I have to buy feed to get them to come to me to pet? A- No, you don't need feed to get them to be able to pet. Q- Are the Animals clean? A- Yes, they receive a good grooming & or Bathe except for the Hamsters, Hedge Hog & Ducks Q- What type of area is required for the Animals to be at our Event? 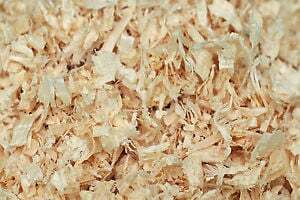 A- As long as you have a some what grassy area it is preferred but if not available we can bring some type of ground cover such as straw if needed but let us know what type of area they will be in. For indoors we have special cages with pine shavings & tarp covers for flooring. Q- Do the Animals bite? A- No, they may be looking for a treat and nibble looking for treats. They do not intentionally bite. Q- How do I know if you can use something I wish to donate? A- Just send us an email to ask us any questions you may have, that aren't answered on our website. 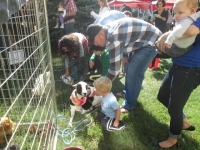 Q- How much time is required for stetting up the Petting Zoo at out event? A- We usually would like to start setting up at least one hour ahead of the Event time. 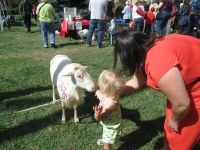 Q- How much advance notice is needed to schedule a Petting Zoo for my Event? A- We would like at least a week notice if at all possible, to get the Animals all cleaned up if need and pack everything up in the trailer & vehicle for the event. But some exceptions have been made. 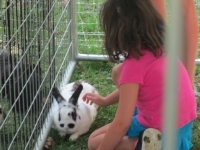 Q- Do you just rent out certain Animals instead of the whole Petting Zoo? A- Just email us with your certain requests, we will try to accommodate all your requests if at all possible.